At Home with Chas: What can I do with all these tomatoes? Tomatoes are coming in, friends. Daily we are gathering more and more, and I am sure you are too! I have been rearranging things in the kitchen and laundry area making better use of my space for food storage and it has been a blessing for sure! So what does one do with an abundance of tomatoes??? Eat them on sandwiches, hamburgers, alongside your breakfast, lunch or dinner! 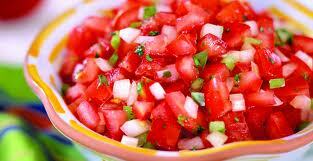 One fantastic way of using your tomatoes is to make up some fresh Pico de Gallo (or salsa fresca=fresh salsa). It's easy, quick and delicious! Serve it alongside your tacos, fajitas, or simply with some chips! Cilantro. As much or as little as you like, it can really add some heat so be careful! Tomatoes are one of the biggest contributors to our pantry. I like to can crushed tomatoes, sauce and tomato soup. Have fun.